Pride of place at the recent Cycling Sports Group show in Wantage went to the new Slate. 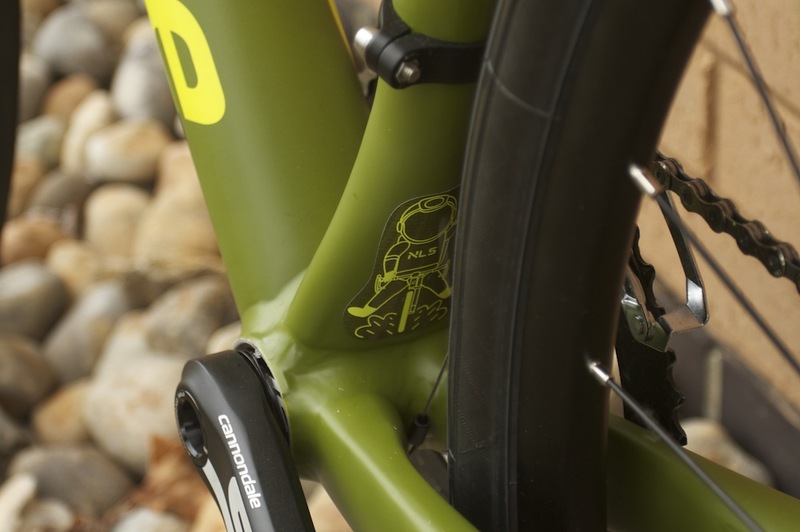 We’ve covered Cannondale’s pre-launch videos of the Slate in previous posts. 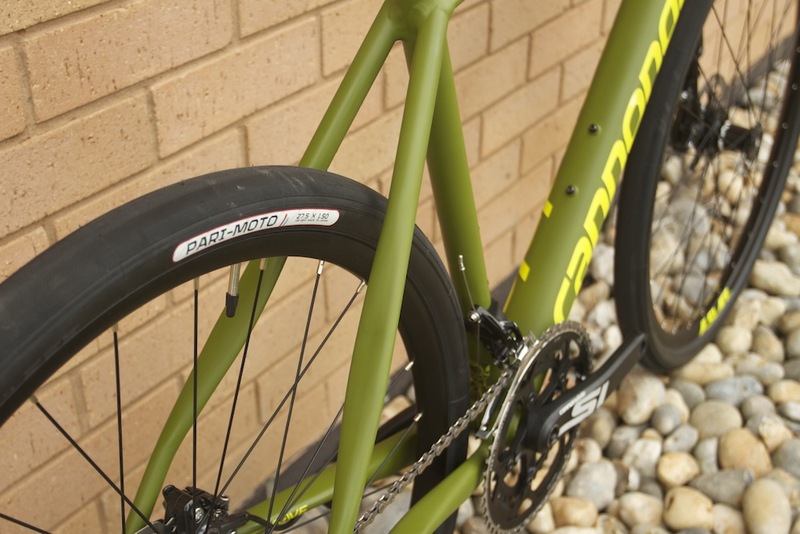 Shown in Army Green with a Shimano 105 drivetrain, the most radical feature is its Lefty Oliver carbon suspension fork, which has 30mm of travel. The Slate also comes with 650b wheels, which are shod with Panaracer filetread 42mm tubeless tyres. Because of the larger tyre diameter, this results in an outside diameter for the wheel-tyre combination which is the same as for a standard 700c wheel shod with a 23mm tyre. This means that the chainstays can be the same length as for a standard road bike, which Cannondale says results in agile and quick handling. The front-centre (the distance between the bottom bracket and the front axle) is extended relative to a standard road bike though, to give the bike more off-road stability and better handling over rougher surfaces. Although suspension is a boon on the uneven surfaces for which the Slate is designed, it can be a disadvantage on smoother roads and when climbing as the up and down movement reduces pedalling efficiency, so there’s a lock-out on top of the fork for when it’s not needed. 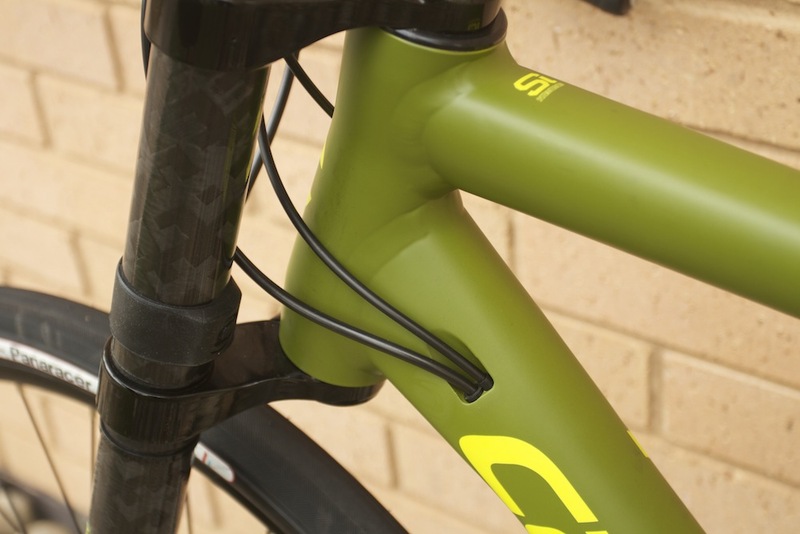 The Slate’s aluminium frame comes with a BB30a bottom bracket, Cannondale’s Save Plus compliance zones built into the chainstays and seatstays, flat mount disc tabs and a 27.2mm seatpost. The front wheel uses Cannondale’s lefty hub, while the rear has a 142x12mm thru axle. There’s forward compatibility with electronic groupsets and internal cable routing for a dropper post too. The Slate will be offered in three builds for 2016. 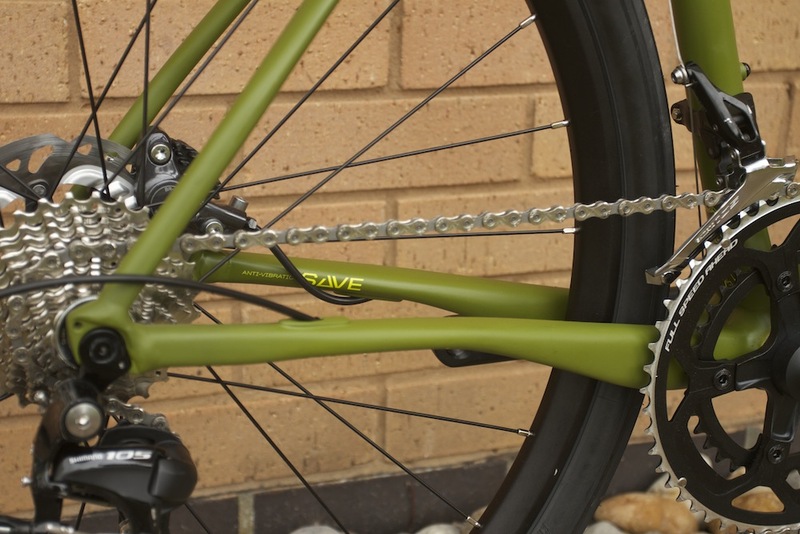 The army green 105 version which was on display comes with Cannondale’s Si chainset with 52/36 FSA chainrings and Shimano hydraulic brakes with 160mm front and 140mm rear discs. It’s priced at £2499.99. Next up is an Ultegra build with a Cannondale Hollowgram Si chainset with SpiderRing single piece forged 52/36 chainrings and Shimano hydraulic disc brakes. For £2799.99, it comes in grey with orange highlights and silver Cannondale logos. Top of the range at £2999.99 is the Slate Force CX1 in black with stealth Cannondale logos and purple accents. This comes with a Cannondale HollowGram Si hollow forged chainset with a 44 tooth single chainring. At the rear there’s a SRAM Force CX1 derailleur running a SRAM X1 XD 10-42 cassette. Brakes are SRAM Force CX1 hydraulic discs. There’s a new video of the Slate recently released by Cannondale. Availability of the Slate range is expected from the Autumn.